Mose’s imparlence erodes his ability to communicate with others. He loses his job, his home, and eventually his girlfriend Zina, from whom he initially hides his condition. Though his life deteriorates, Mose eventually lands a job as the maitre d’ of an overpriced French restaurant. Here, his sympathies extend to the overworked kitchen staff, and he takes a stand against the unjust working conditions, trying to make meaning through his actions, even as his words fail to communicate. MOSE: Tell me something, Jeff. Those numbers convincing to you? Bring me the swordfish. Not blackened. You got that? Not blackened. Go. Nice, Zina – the chart is really good. Zina, your students will love it! Tell him that and he’s totally going to have a kitten! extractions, he won the Kamden Prize for his research into adjacent fauna protection and occasionally lectures in his field. As Mose’s imparlence worsens, the tension between Mose and the world he cannot communicate with increases, erupting in moments both tragic and comic (and farcical and tragicomic). The swirl is often there to assuage him (and the audience), armed with a humorous (and occasionally ironic) quiver of quotes from the likes of Melanie Klein, William H. Gass, Jean Jacques Rousseau, St. Augustine, and television personality Doctor Oz. MOSE: But the doctor – the doctor recommended medicine! …a prescription…to pay him five hundred and twenty dollars… And I thought bleeding patients went out in the nineteenth century. SWIRL MEMBER: There’s been a strong return to traditional medicine. (Other jokes don’t land so neatly—in a segment mocking TV drug commercials, a swirl member offers up an absolute groaner with the phrase “irregular vowel movements.” Who knows though? Maybe the joke plays well on the stage). With all of its humor, Provisional Biography is ultimately a sad, even tragic story, and nowhere is it sadder than in Mose’s revelation that he can communicate to other humans through one medium: economic exchange. He takes to desperately buying Tic Tacs from street vendors simply to communicate intelligibly, and eventually resorts to buying phrases from a fellow homeless person. rest of my days – flapgaggle and hope? SWIRL MEMBER: Perhaps inevitable. According to Robert Nozick of Harvard, imparlence is just the latest expression of the ownership society. provided by a command and control center. The swirl here satirizes the newspeak of late capitalism, imagining language—a thing that makes us inherently human—as yet another commodity to be consumed and sold back to us by a dehumanizing system that seems to operate on its own inscrutable logic. While there’s humor in the little scene, it’s also quite painful. The idea that late capitalism reduces linguistic exchange to only an economic (and thus inauthentic) exchange is repeated again in a far more painful scene later in the play. Mose pleads for “Something real…A real response – something that speaks from the heart!” from the homeless man he has been buying phrases from, to which the man simply puts out his hand for a coin. “Is that the only thing left?” cries Mose. The swirl is there to offer an out to this existentialist despair: “Salvation–only through action! Guided by further philosophical slivers proffered by the swirl, Mose converts his despair into radical action by the end of the play. The conclusion is fittingly moving and movingly strange. Provisional Biography of Mose Eakins, in showing a human communication dissolve, follows Dara’s 2013 novel Flee, which shows a town dissolve. Flee is an oblique but devastating address to the 2008 economic collapse in America, and Provisional Biography is a fitting follow-up, continuing Dara’s critique of the human position in the late-capitalist landscape. And what would “reciprocation” mean, in the end? Write your own two-act play about the relationship between language and commerce in the early 21st century and send it to Evan Dara? I finished Gerald Murnane’s 1982 novel The Plains last week. The Plains is quite short—it’s a novella really—and is divided into three parts. I read Part I in two sittings, gulping down the first-person narrator’s description of an Australia that exists in some alternate universe, where aristocratic plainsmen of Inner Australia keep grand houses populated by every kind of artisan. The novel’s first 70 pages or so move at a brisk pace, brimming with hints of a mythology that Murnane’s narrator keeps always just outside the frame. I read Parts II and III (much shorter than Part I) at a much slower pace. Murnane’s prose condenses here, his sentences tangling out into thick knots of consciousness. I’m still not sure what to make of the novel’s conclusion. I’m absolutely crawling through Mario Benedetti’s The Truce (in English translation by Harry Morales). Subtitled The Diary of Martín Santomé, this Uruguayan novel is told in lucid prose. Santomé’s journal entries track his day to day life as a man with three children—the youngest approaching adulthood—who was widowed early in life. He’s just now started up a love affair with a younger colleague (an affair that he doesn’t want to call an affair and an affair which I think is like hey a very bad idea, Martin!). It reminds me a bit of John Williams’ novel Stoner. I’ve been reading one or two of the diary entries a day, usually in the morning before I leave for work. It’s a different way to read a book (at least for me anyway). Herman Melville’s The Confidence-Man is my big re-read right now. I’m having a lot more fun with it the second time. I think the first time taught me how to read it. I’m moving pretty slowly but that’s fine. I read most of Antoine Volodine’s Post-Exoticism in 10 Lessons, Lesson 11 in two sittings. I want to write a proper review of the novel, or novella, really, or really it’s something besides a novel or novella—anyway, I want to write a proper review on the thing, but I need to go back and finish his novel Minor Angels, which I started earlier in the summer but lost track of (I think I was trying to plow through the end of Eliot’s Middlemarch at the time). I’ve read the first and third (but not the second) stories in Helen DeWitt’s new collection Some Trick and…I don’t know. There’s a part of me that doesn’t trust my reaction so far. I know that what she’s doing here would’ve flipped any wig I was wearing ten or twelve years ago, but I find myself not particularly persuaded to keep going. I skipped to the third story because it had a bunch of footnotes, a la DF Wallace and that intrigued me. It’s a bit clever, yes? I’ve only read two of the stories in Tadao Tsuge’s collection of “alternative manga” (mostly from the sixties and seventies) Slum Wolf (in English translation by Ryan Holmberg), but there’s definitely a different flavor here—rough, weird, and a bit chilling. I hope to post a review of Slum Wolf at The Comics Journal next month. Not pictured above because I read it on an iPad: The first two chapters of Anders Nilsen’s graphic novel Tongues, which is a loose retelling of the story of Prometheus and a few other myths (maybe). There’s a lot going on it. The art is gorgeous—a bit reminiscent of Geof Darrow, but more not as sprawly. Again, I hope to do a review at TCJ soon on these. Also not pictured because also an e-book: Provisional Biography of Mose Eakins, a two-act play by Evan Dara. You can download the play here without paying upfront: The site instead gives this somewhat cryptic message on payment: “If you please, reciprocation accepted only after reading. Thank you.” The message actually makes sense after you’ve read the play, which is very much about paying for language—literally utterances as commodities. Mose Eakins is “imparlent” — he cannot communicate with those around him. The play is often funny, but also very sad, and it’s impossible not to read it as an allegory for the limitations of real communication in the age of late capitalism. I read it all at once last night. Speaking of which, I need to reciprocate now. Pynchon’s zany/sinister tonal axis, comic bravado, and genre-shifting modes rarely result in what folks narrowly think of as literary realism. His characters can be elastic, cartoonish even—allegorical sometimes (and even grotesque). Mason & Dixon takes two historically real (and historically famous) characters as its subject, and, in a wonderfully hyperbolic 18th-century style, takes the duo on a fantastic journey to measure the world. How does one measure the world though? Pynchon takes on seemingly every subject under the sun in Mason & Dixon, and the novel is very much about the problems and limitations of measuring (and describing, and knowing) itself. But what comes through most strongly in all of Pynchon’s fantasia is the weight of Mason and Dixon’s friendship. It’s the most real thing in a wonderfully unreal novel. A bit of a cheat maybe to put short stories on this list, but I’d love to set aside time to go through all of them at once. So far, my favorite character in Middlemarch is Dorothea Brooke. In part my allegiance to her is simply a matter of the fact that she initially appears to be the novel’s central character—until Eliot swerves into new narratives near the end of Book I (Book I of VIII, by the way). But beyond traditional formal sympathies, it’s the way that Eliot harnesses Dorothea’s consciousness that I find so appealing. Eliot gives us in Dorothea an incredibly intelligent yet palpably naive young woman who feels the world around her a smidge too intensely. Dorothea is brilliant but a bit blind, and so far Middlemarch most interests me in the way that Eliot evokes this heroine’s life as a series of intellectual, emotional, and aesthetic revelations. We see Dorothea seeing—and then, most remarkably, we see Dorothea seeing what she could not previously see. I am really loving this book so far, this novel that moves through consciousnesses in a (yes, I’ll use that cliché that book reviewers so often grab for) dazzling performance, shifting through minds, monologues, dialogues, always a few steps (or more) ahead of its reader, beckoning though, inviting, calling its reader to participate in discussions (or performances) of art, science, politics, psychology, education, loneliness, ecology, family, fireflies, radio plays, alienation, voting trends, Chomskyian linguistics, Eisensteinian montage, theft, Walkman Personal Stereos, semiotics, one-man shows, drum sets, being ventriloquized—a novel that takes ventriloquism as not just a theme (as we can see in the citation above) but also as a rhetorical device, a novel that ventriloquizes its reader, throws its reader into a metaphorical deep end and then dramatically shifts the currents as soon as the reader has learned to swim, a novel of othernesses, a novel that offers content through conduits, patterns that coalesce through waves, a novel composed in transfer points, each transfer point announcing the limitations of first-person perspective, the perspective that the reader is logically and spiritually and psychologically beholden to—and then, perhaps, transcending (or at least producing the affective illusion of transcendence of) first-person perspective, and this (illusion of) transcendence, oh my, what a gift, what a gift . . . The Recognitions is the work of a young man (“I think first it was that towering kind of confidence of being quite young, that one can do anything,” Gaddis says in his Paris Review interview), and often the novel reveals a cockiness, a self-assurance that tips over into didactic essaying or a sharpness toward its subjects that neglects to account for any kind of humanity behind what Gaddis attacks. The Recognitions likes to remind you that its erudition is likely beyond yours, that it’s smarter than you, even as it scathingly satirizes this position. I think that JR, a more mature work, does a finer job in its critique of contemporary America, or at least in its characterization of contemporary Americans (I find more spirit or authentic humanity in Bast and Gibbs and JR than in Otto or Wyatt or Stanley). This is not meant to be a knock on The Recognitions; I just found JR more balanced and less showy; it seems to me to be the work of an author at the height of his powers, if you’ll forgive the cliché. Bolaño’s opus is the kind of literary masterpiece that survives they hype that surrounds it. I’ve read it straight through three times and will read it through three more given the chance. I’ve written at least seven “reviews” of 2666 on this site, but this one on the novel’s intertextual structure is probably my best effort. J R by William Gaddis. 1993 trade paperback edition by Penguin. Cover art is a detail of an Associated Gas and Electric Company stock certificate “Courtesy of William Gaddis.” No designer credited. Infinite Jest by David Foster Wallace. 1997 first paperback printing edition by Abacus (Great Britain). No designer credited. The Lost Scrapbook by Evan Dara. First paperback printing by Aurora, 1998. Cover design by Todd Michael Bushman. 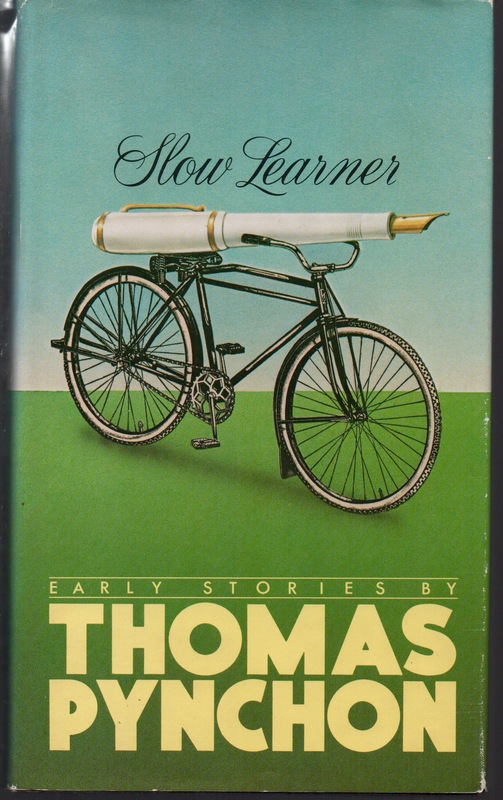 Slow Learner by Thomas Pynchon. First edition hardback by Little, Brown (1984). Jacket design by Fred Marcellino. I’ve only read “Entropy” from this collection so far. (I actually tried to use it in my Intro American Lit class—it’s in The Norton Anthology of American Literature, Vol. E, somehow—and no, it didn’t go over well, but hey). 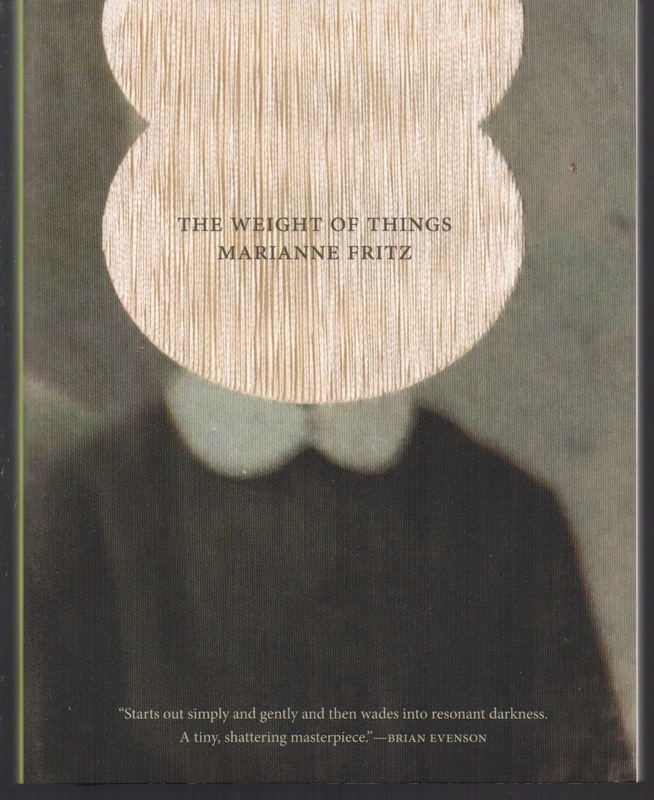 The Weight of Things by Marianne Fritz; English translation by Adrian Nathan West. First edition trade paperback from Dorothy (2015). Cover art is Anonymous by Hella van ‘t Hof. Book design by Danielle Dutton. I started this as the chaser to Ishmael Reed’s The Free-Lance Pallbearers—proved to be a false start (went on a Le Guin jag instead). Feels like a one-sitting read. The Easy Chain by Evan Dara. First edition trade paperback from Aurora (2008). Cover and design by Todd Michael Bushman. Does anyone want to read The Easy Chain with me? The Crack-Up by F. Scott Fitzgerald; edited by Edmund Wilson. A 1956 New Directions mass market paperback. No designer credited. The Crack-Up collects autobiographical pieces by Fitzgerald, along with letters and essays by some of Fitzgerald’s contemporaries and near-contemporaries—but the highlight is the inclusion of Fitzgerald’s note-books. (I shamelessly plundered them on this blog for years). Its cover is black and white and gray. An Armful of Warm Girl by W.M. Spackman. 1981 trade paperback edition by Van Vactor & Goodheart. Cover design by Leslie Evans. A perfect little novella, with a perfect opening page. Its cover is black and white and gray. Flee by Evan Dara. 2013 trade paperback edition by Aurora. Design by Todd Michael Bushman. Blogged about it here and here. Its cover is black and white and gray. Read part one of our discussion of Flee. Ryan Chang: Right–Flee doesn’t prescribe a future, or at least an alternative future. “841” testifies to this. The A-burgian upstakers are no different from the new settlers, rejoicing in the bargains to be had in the town. Carol and Marcus quietly disappear (Spoiler alert). Flee is overall hesitant to prescribe, I think. In my previous e-mail, I was thinking out loud a bit, trying to see if something in the book was pointing to these spaces of the “nonidentical” as Adorno calls it; that Flee as an aesthetic object figures, in exactly what isn’t said, the suffocating presence that squeezes the life out of A-burg, could figure a moment of possibility in absence. Some kind of fracture that, even if it is a failure (as A-burg is, I think), is a temporary moment of reprieve from the administered life. [Context/editorial note: I’ve been meaning to read Evan Dara’s latest novel Flee for a while now, and when Biblioklept contributor Ryan Chang told me he’d be reading it as part of a contemporary literature class I decided to join him. This is the first part of a two-part discussion which took place over a few weeks of emails. — ET]. Edwin Turner: So you’re reading Evan Dara’s Flee for a class, right? What’s the name of the class again? What are some of the other texts in the class? Ryan Chang: Yeah, a class called 21st Century Fiction: What is Contemporary? We started out reading Reed’s Mumbo Jumbo and Acker’s Empire of the Senseless. We just finished reading Egan’s A Visit From The Goon Squad (awful), and we’re moving onto Chaon’s Await Your Reply and Pynchon’s Bleeding Edge. Everything, up to Pynchon, has as its central conflict the dissolution of the subject vis. the postmodern. Perhaps because of the spatialization of time (Egan, Reed) or a steroidal fungibility of a self because of technology (Chaon). The awareness of how deeply we are disciplined by master narratives (Acker). We’ve yet to get to Blake Butler’s There Is No Year and Richard Powers’ The Echo Maker, which I’m looking forward to after the Chaon and Egan who, in their attempt to write novels critical of the contemporary (more so of Egan, who does nothing but neuter the very real state of late capitalism’s terror into entertainment), do not make it past the merely interesting. I liked the Egan much less than the Chaon; part of the problem is the prose style, I think — it’s characteristically white American, shaped by sentimentality and preoccupied with the syntax of conventional form. In other words, the blueberry muffin prose styles betray the experimental forms in which they’re enveloped. ET: I always have to look up the word fungibility. Dara’s Flee seems to fit into that early theme you mention, the conflict of the dissolution of the subject, which is both the book’s formal rhetorical strategy, but also its plot program, encapsulated (maybe) on page 45: “What is the weight of we?” What do you make of Dara’s style here? Like initial impression? RC: I’m about ~40 pages in. I think I mentioned in the Books Acquired thing I wrote that Dara, stylistically, is hitting hard on Gaddis. Admittedly, I’m most familiar with the late Gaddis — Carpenter’s Gothic. (Agape Agape, too, but this is, of course, his letter to Bernhard.) I like that both focus on voice, on streams of speech that collide or blur into each other. The Gaddis influence is more of an echo than anything. Specifically re: Dara — the interruptions, digressions and hesitations immediately struck me as something like a Tragic Greek chorus that, having incurred some sort of its own trauma (and not acting only as the all-knowing unconscious of the play), is completely disoriented, confused of its own purpose. But amidst the cacophony–or something like a directed cacophony towards the reader–they are still unwittingly functioning as a chorus. They’re giving us the stage for Flee’s story, hinting quietly at the book’s central plot conflict. Also naming characters (Carol, Rick, Marcus, etc), which is now more intriguing to me at the passage from p.45 you mention. What’s also different in Carpenter’s Gothic is, while that whole book remains on one diegetic level (as far as I can remember, it’s been a few years) because no narrator ever announces itself, in Dara, there’s a blurring of diegetic arenas, a refusal to centralize any narrative authority. Ok, so, re: dissolution of the subject: It seems that not only are the chorus members interrupting themselves, but they’re also interrupting the narrator as well. Each left-margin emdash cuts the narrator off, in a way, if you will. That scene when they’re pitying Rick, acting as a narrator with dialogue tags. The commonly individuated voice of the narrator is subsumed into the characters’ diegetic arena; a tension between the collective and individual implicit in prose structure alone. It also seems, by “36,551,” that whatever the population is fleeing from is not collectively driven (ie., the pity for Mark’s poorly planned meetings for something, we don’t know what yet), but selfishly driven. And in the flattening power of numbers, that selfishness — a hermetic individuality — becomes collective. There is a kind of infinite distance between I and we that, perhaps, the book is trying to trace? Or its relationship in the temporality of the novel is a perpetual expanding/contracting relationship, like a rubber band? As far as I am in the book, the interruptions and digressions also have a hysteria to them that points to something the chorus is ignoring even in the face of the beginnings of a series of rude awakenings. Each voice just bemoans this dissolution of themselves; but, especially in the scene where Rick is, like, torn apart for his idea in service of the township, each voice is just narcissistically concerned with how it’s going to inconvenience them, rather than the potential worth of Rick’s idea. A. 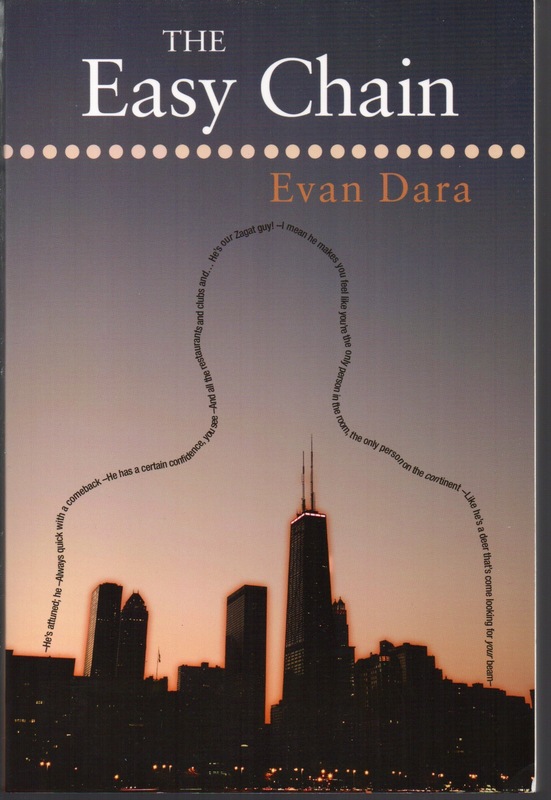 What a cover on Evan Dara’s 2013 novel Flee, don’t you agree? C. That’s all there is. Well, okay, there’s an ISBN too. But no blurbs, no other text. D. “Something always going on—” is the first line of Flee. It’s also an apt description of Dara’s formal technique, a constantly-shifting series of dialogues, monologues, overlapping, cross-cutting, diverging—always out there ahead of the reader. That dash there—that dash is the simple summative signal of it all, a little typographic pole that simultaneously connects and interrupts. E. The most obvious point of comparison for Dara’s technique (besides his amazing debut novel The Lost Scrapbook) is William Gaddis’s stuff, particularly J R—the verbal dazzle, the few stray lines of poetic stage-setting in lieu of traditional exposition—the throw-the-reader-in-the-deep-end stuff. David Foster Wallace frequently attempted the same rhetorical mode, most successfully in §19 of The Pale King. (It’s entirely likely that The Lost Scrapbook could have had the same following that Infinite Jest achieved had Dara done anything to promote the book. But here I think of Gaddis in his Paris Review interview: “I’d go back to The Recognitions where Wyatt asks what people want from the man they didn’t get from his work, because presumably that’s where he’s tried to distill this ‘life and personality and views’ you speak of. What’s any artist but the dregs of his work: I gave that line to Wyatt thirty-odd years ago and as far as I’m concerned it’s still valid”). G. So I’ve read the first three chapters (“38,839,” “38,842,” “36,551”). But wait: The next chapter (“35,717”–do the titles reflect the dwindling population of the town (Anderburg)? )—but wait the next chapter, I see by scanning, offers some new, perhaps, rhetorical gesture—a section in a different font? Chunkier paragraphs? I have to go see about this. (More to come). I am taking a class titled 21st-Century Fiction: What Is The Contemporary? and three of the books in this photograph are part of the reading list. Absent titles are by Dan Chaon, Kathryn Davis, Ben Marcus, Blake Butler, Sheila Heti. Some others. Wanted titles: Tao Lin’s Taipei (which I am reading now, which is surprisingly good). I don’t know anything about Dodie Bellamy beyond the fact that she is often grouped with Kathy Acker, who are both often grouped with Dennis Cooper, who are all New Narrative people. New Narrators make the author present, her body and sexuality usually the prime subject. Letters of Mina Harker is a “sequel” to Dracula, except Mina Harker is a young woman who lives in 1980s San Francisco. On conceit alone, it reminds me of Kathy Acker’s Don Quixote: Which Was a Dream. Richard Powers and Evan Dara are often grouped together, mainly because Powers blurbed his first book, The Lost Scrapbook, and that both of them write books that weave disparate discourses into their fiction. Also, there is speculation that Powers is Dara (Or Dara is Powers). Flee is, according to its publisher Aurora Books, about “in which a New England town does just that.” I’ve read the first chapter, titled “38,839,” and it reeks of Gaddis (in a good way). Disembodied voices colliding into each other, a cacophonous plot; the absurd & banal drama of everyday, throwaway conversation. 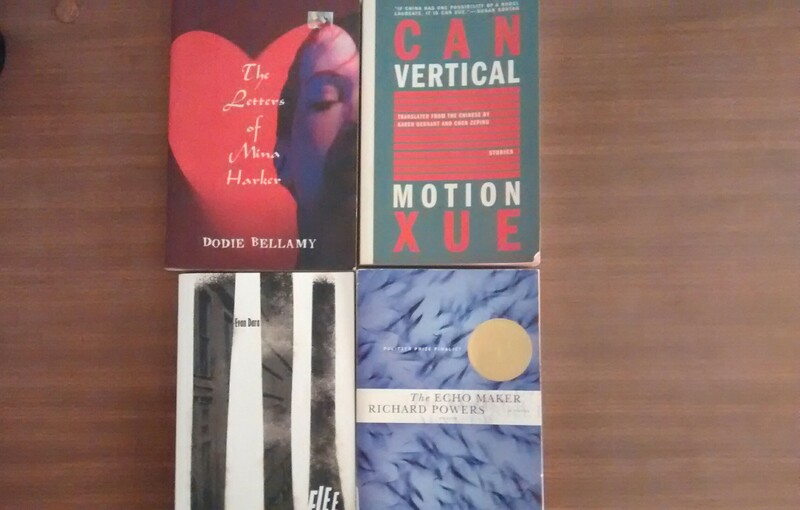 An Australian book show on Triple R Radio, who have a good and very rare interview with Gerald Murnane (whose book Inland I was really, really jazzed on), also really loves Dara. I’m pretty excited to read this one. Evan Dara and Richard Powers are often grouped together, mainly because Dara’s first book was blurbed by Richard Powers, and that both of them write books that weave disparate discourses into their fiction. Dara might be Powers (or Powers might be Dara? ), but that doesn’t really matter. The Echo Maker is supposed to be one of those Big, Important American Books (as noted by the shallow, embossed seal on my used copy of the book). As I write this, I am listening to Powers read from The Echo Maker from an old Lannan Foundation talk (who also really love Gass) and I am really intrigued. I haven’t flipped through this, so I will reproduce the back copy. On a winter night on a remote Nebraska road, twenty-seven-year-old Mark Schluter has a near-fatal car accident. His older sister, Karin, returns reluctantly to their hometown to nurse Mark back from a traumatic head injury. But when Mark emerges fro a coma, he believes that this woman–who looks, acts, and sounds just like his sister–is really an imposter. When Karin contacts the famous cognitive neurologist Gerald Weber for help, he diagnoses Mark as having Capgras syndrome. The mysterious nature of the disease, combined with the strange circumstances surrounding Mark’s accident, threaten to change all of their lives beyond recognition. Can Xue (which roughly translates from Chinese, according to my mother, to “persistent & dirty snow”) is hailed by western critics to be the Chinese avant-garde heir to Kafka and Borges. Can Xue is a pen name for Deng Xiaohua. She is of my mother’s generation and her class, which means she grew up persecuted during the Cultural Revolution, which means she was sent to a “re-education camp” in the Chinese sticks and learned to farm. She taught herself English, has written criticism on Kafka and Borges. The strangeness of Kafka echoes in Xue. While the former’s strangeness arrives in the narrative with a kind of grim inevitability, the discovery of a debilitating truth lands like an obvious punchline that the reader stupidly forgets (or realizes too late, like the classic Seinfeld episode “The Comeback“), Xue’s arrives with a kind of startling innocence against the backdrop of dramatic irony. It is like watching, in Michael Haneke’s words in his great interview in The Paris Review, a tragedy from the perspective of an idiot. The title story, “Vertical Motion,” can be read here. I am reading too many books. I am hoping to write about a few of these before the month is over, starting with Chrostowska’s Permission (my review is long overdue). I’m about fifty pages shy of finishing Evan Dara’s The Lost Scrapbook; the book has been a revelation, one of those “How-the-hell-didn’t-I-know-about-this-already-?” deals. I’ll lazily compare it to Gaddis’s J R and DFW’s Infinite Jest. I fell into rereading Snow White after working through several dozen of Barthelme’s short stories again. He’s probably the best. Also the best is Tom Clark, whose poetry also falls into that “How-the-hell-didn’t-I-know-about-this-already-?” spectrum. Quick thought on the beginning of Walser’s Jakob von Gunten: Seems part of a little mini-genre that includes Barthelme’s “Me and Miss Mandible” and Gombrowicz’s Ferdydurke. Sorry for the lazy blogging. I will try to do better. From Evan Dara’s novel The Lost Scrapbook.